Well, as it turns out mom and dad doves knew what they were doing, and hiding it quite well. Today I looked out the window and the nest was vacant! Upon closer inspection, there was the baby dove on the ground, going through her final pre-flight check. Minutes later, he/she was up on the wall being fed by mom (or dad), and while he/she’s hung pretty close to the tree all day long, baby dove appears to have officially flown the coop. Which is great, because the side and the back desperately need some lawnscaping attention! To watch the Red Sox lose like they did today was heartbreaking. There’s no excuse for Kevin Youkilis watching a called third strike go by with the tying runner on third with one out. In a sitiation like that you have to be aggressive. I’m very concerned about the Sox’ lack of offense coming out of Loretta and Gonzalez at second and short, respectively. The defensive skills they bring are well understood, but in the American League these two positions are also offensive ones, and as the season goes along, the pressure to produce offensively will only get worse. One final note about the Sox: Rudy Seanez is a bust. Enjoying the last couple of days of reasonable weather, as, starting Monday the temps are gonna be in the low 100s and it looks like they may stay awhile. Looks like momentum is building for a massive outpouring of protests for Uno de Mayo this coming Monday. For the life of me I just don’t understand what the pro-iillegal immigration advocates hope to achieve. I can tell you that in the circles I travel in, people are pretty pi$$ed off about the whole thing, and I share this view that the protests risk losing whatever sympathy and support they might have gained from the March rallies. For the record, Michelle shows the original Francis Scott Key manuscript and related cool stuff! There have beeen more attempts at foreigners – in this case, from Saudi Arabia – successfully hacking into conservation weblogs. Michelle has all the intriguing details. Maybe it’s just me, but the spike in gas prices doesn’t bother or surprise me. But, of course, it does the Democrats, who are clueless on national energy policies. My bet is that many of the same people howling about high gas prices are either: a) driving large SUVs, b) stacked in line waiting at fast-food drive thrus for the third or forth time that week, c) opposed to drilling in ANWR or off our coasts, d) opposed to nuclear power plants, e) the first ones who would scream about an oil refinery planned for their community, or f) all of the above. The fact is, we live in a far different world now than we did thirty years ago, and it is the emerging, energy-thirsty Asia economies and greedy world-wide market speculators that are primarily responsible. Complaining about oil company profits is useless – they’re the ones taking all the risks, they should reap the rewards. Congrats to Rob and the New Orleans Saints fans – they got Reggie Bush, and that should generate some much-needed enthusiasm and excitement in The Big Easy. Perhaps this is an omen of good things to come – like, maybe, a less-than-boisterous hurricane season? No sign of progress on the Mourning Dove Maternity Watch – I’m starting to think the original egg was not going to produce a baby, and there’s another egg in the oven. Either way, mom and dad don’t appear to be concerned, so why should I? …Wasn’t that the name of a Gogi Grant one-hit wonder? From the sounds of it, she was in that same early-to-mid 50s class of popular music artists as Rosemary Clooney / Jo Stafford (? ); I’ll let Auntie Marge comment on that – she’d know better than anyone! In New England where I come from, you can always tell from the sky when the weather is about to change for the worse. You have a nice day: blue sky, gentle or no breeze, but then that mackerel sky starts to appear, and you can bet your run of good luck is about to end. Here in the Arizona desert, it is the wind that tells you a change in the weather is about to happen. Case in point: yesterday afternoon. It was round 85 or so, with a high blue sky and intense sun that burned your skin even if you were out for a short walk. Around eight last night, we could tell a breeze had sprung up, ’cause we heard the wind chimes outside. This morning, we had the same blue sky as yesterday, but the air felt different and the sun not quite so intense. Sure enough, the wind picked up during the day, clouds formed, and the temperature dropped to around 70 – cool for this time of year. We even had a sprinkle pass through earlier tonight. Walking outside tonight to figure out a) why my front lawn watering system seems to be no longer operational, and b) why my pool filter seems to be running on a different schedule (more on that another time – grrrr), I could see that the clouds had moved on, the wind too. The air has once again changed, and you can tell it will be back to the 80s again tomorrow. That’s weather here in central Arizona. It’s been a relatively cool spring thus far, and very dry. People ’round here seem to think that means a hotter summer than usual (now THERE’S something to look forward to, eh?) with less chance of an extended monsoon in late summer. We’ll see. Today I found out I’m going to New Orleans for 3 days two weeks from this coming Saturday. The thought of it makes me excited, yet strangely apprehensive at the same time – almost like when you know you’re soon to meet someone you love, knowing they’ve been through a very difficult or different time and you don’t know what to expect. For the past several weeks, all we’ve been hearing about here in Phoenix is the absolute chaos that will result when “Uno de Mayo”, the organized May 1 boycott of work by illegal aliens being pushed by so-called “immigration rights advocates” (who, BTW, could care less about the rights of Indians, Russians, and Asians pursuing already-established legal paths to immigration, only those from Mexico and Central and South America who have entered the country illegally via our unprotected southern border). Supposedly, the purpose of said boycott was to show just how much us lazy, affluent, uncaring (but legal!) American citizens absolutely depend on illegal immigrantion to support our way of life by doing the work no one else is willing to do. You see, I’ve never been a fan of boycotts. When Christian fundamentalists protested Monty Python’s movie Life of Brian upon its release back in 1979, all it did was generate more publicity for what was, truth be told, a pretty minor release at that time. When Major League Baseball went on strike, I wasn’t pleased, but when it started up again I watched, listened, and enjoyed it as much as I did before. Whenever I pass union workers protesting in front of a business, I usually make it a point to change my plans and immediately turn in and buy something. As much as I think the French are a bunch of miserable, ungrateful ba$tards, I have a bottle of Grey Goose vodka in the refrigerator and would gladly purchase a truckload of Veuve Clicquot if I had the dough. When Democrats decided to play the obstructionist card on Republican attempts to reform Social Security, confirm strict constructionist judges, drill in ANWR, support the Administration’s efforts in Iraq as the main front on the Global War on Terror, and protect our nation’s borders, I said no problem – I didn’t vote for you before, and I’ll be happy to continue that pattern until you smarten up and put forth your own alternative plans to reduce the deficit and wasteful spending, reform bloated government assistance programs, and begin to take our nation’s security (economic and otherwise) more seriously. As this Uno de Mayo boycott got closer, however, of a sudden, those promoting this idea – at least around the Phoenix area – started getting a little cold feet. A couple days later, it appears to be back on, but methinks there’s enough cases of the yips going on here (to put it in golf terms) that it’s not gonna be nearly as big as once envisioned. And you know why? Yesterday the thought occurred to me: why stop at simply boycotting work? Why not attempt a 100% boycott of EVERYTHING illegals do in American society? In other words, don’t just boycott your workplace on May 1, drop out of American society for one day and see what happens. You know, boycott the schools, colleges, and universities that educate your children; boycott the hospitals and care centers that treat you and your families; boycott the restaurants and businesses that serve you and provide you opportunities to work. But you know what? They won’t do that, and you wanna know why? Because, Skeezix, they know the road to El Dorado runs in both directions. Illegals get as much – (actually, when you consider the drain on our public and private services, perhaps more) from being here than they give. Heck, isn’t that why they risked life and limb to get here in the first place? How can you rally a major protest about something that benefits you far more than you it? My guess is, in the end I don’t think there is going to be this massive outpouring of supporters clogging highways, closing restaurants and public buildings that everyone fears. Oh, there’ll be scattered boycotts and rallies, but nothing like the ones we saw a month ago. After all, these promoters and so-called “advocates” aren’t stupid – they know they got their voices heard in March, and they now fear all that good progress might be lost amidst amidst a backlash that might go something like this. Like I say, for me it doesn’t matter. I was planning on a pitcher of #6 margaritas featuring La Hacienda del Rio’s Official Lime Juice to show my support not matter which way the wind blows. After all, around here the wind only blows three ways: dirty, dry, and hot. I see no reason at this juncture to change my plans. Do you? Feeling a little squirrelly starting at those cubicle walls. Feel like mooooving yourself out of that nice comfy chair now that it’s spring? Hopping mad about the gas prices down at the local service station (thought: do they even call them that anymore?)? If you get a smile from checking out these unusual sites, well, I toad ya so! This site is pure bovine madness – and I ain’t talkin’ the “mad cow” variety. It’s in support of the PBS series Texas Ranch House. Check out the “cow cam” (dial-up users. you may find it takes a while to load). What’ll they think of next? One creature I miss out here in AZ is the Gray Squirrel. (We have these wacky looking things called the black squirrel, but to me they’re just hawk and vulture food.) I know, I know, squirrels are destructive ba$tards and a pain in the a$$, but they’re also fascinating and cute too. I still remember the legendary battles my dad and Mr. GS used to have out on the back porch of their condo as he tried to protect his bird feeder from these glorified rats. Well, if you too have a hankerin’ for those squirrelly days of yesteryear, check out this site. My friend Dona is absolutely bullish about bullfrogs. Here is a site for you frogaholics. Me? I’m not exactly an environmentalist wacko, but I do love whales. So here is a beautifully done website about everything whale. My sister-in-law Tam just got herself a new bunny. I sure hope Marshmallow (well that’s not exactly her, but you get the picture) knows what she’s getting herself into. A perfect time to remind everyone that rabbits are not just for cages (or dinner, for that matter), anymore. Give these guys a nice play area and you’ll be amazed at how they steal your heart! 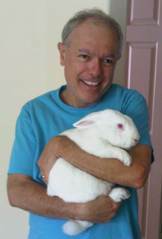 The House Rabbit Society tells you everything you’ll need to know about pet rabbits. And, I’d be remiss if I didn’t mention that this is Day 14 of MDMW (Mourning Dove Maternity Watch). That egg has to hatch any day now. Now I know how Tom Cruise was feeling last week! My good friend and AZ rapper Dollar Bill returned to his native New Orleans for a recent visit. His thoughts on what he saw and experienced here. Speaking of New Orleans, it appears that the Army Corps of Engineers is now saying levee improvements won’t fully be in place by the time hurricane season starts (just over a month from now, by the way). This, as the most powerful cyclone ever recorded is bearing down on Darwin, Australia. Yikes. So, Salt River Project (our power company out here in AZ) wants a rate hike due to climbing energy costs. What do you think the chances are they will ask for a rate decrease if and when gas prices come down? Uh huh. Probably the same as the Kansas City Royals making .500 this season. Last night I finally got around to watching the 2-DVD Brian Wilson Presents SMiLE set, containing a 90-minute documentary about the history of the legendary 1967 Beach Boys album project abandoned and thought by most never to be released, then amazingly resurrected, reassembled, and release by Brian in 2004, and a concert performance of the album in its entirety by Brian and his new band. While the documentary provided an interesting history of the SMiLE project (one, by the way, very favorable to Brian, given his history of mental problems and drug abuse), it was the concert in vivid 5.1 Surround Sound that was truly spectacular. To see and hear these legendary SMiLE songs performed with such detail and joy by everyone involved (especially Brian) was a wonderful and astonishing thing to see. The film and sound quality truly made you feel like you were there, witnessing an event in popular music history that, unlike so many other events of this sort, actually lived up to the hype. Speaking of the Beach Boys, I was wondering if, given the upcoming 40th anniversary of the release of their spectacular Pet Sounds album coming up, something like this would be possible. Given Brian’s new-found touring confidence, here’s hoping that the other surviving members can bury their egos long enough to do an anniversary of this magnitude justice. …actually, I’m glad the beehive is gone. Otherwise I’d have to look at something like this. I awoke to the sound of loud, insistent quacking and allowed it to mix with the usual symphony of morning songbirds, cooing mourning doves and braying jays as it washed over my half-awake state. When the quacking continued over the next 10-15 minutes, to the point where it started to sound hoarse, I grew concerned that the duck might be in some distress – perhaps caught or trapped in the tiny cemetary next door or across the street in the woods. I tossed on some clothes and tiptoed out of my parents’ apartment and exited to a crisp April morning. As I walked the perimeter of the apartment complex, I began to realize that the quacking was coming not from outside the complex, but within it, where there is a good-sized courtyard, complete with swimming pool. So, back into my folks’ apartment building I go and exited out the other end, to the courtyard. Peering around the corner, there they were: a duck couple obviously in the throes of spring courtship: the male quacking away happily in the swimming pool, the female watching intently poolside. Tracey awoke to the sound of loud, insistent quacking and allowed it to mix with the usual symphony of morning songbirds and cooing mourning doves as it washed over her half-awake state. When the quacking continued over the next 10-15 minutes, to the point where it started to sound hoarse, she grew concerned that the duck might be in some distress. She tossed on some clothes and stumbled half-asleep to the slider that looks out on our backyard. Scanning the yard to see where the noise was coming from, there they were: a duck couple, obviously in the throes of spring courtship: the male quacking away in the swimming pool, the female watching intently poolside. Two people, two pair of ducks, two swimming pools, 2,729 miles and 6 hours apart, sharing for a brief moment in time the curious and exhilarating ways of nature. A beautiful thing. …so my friend Dona wants everyone to know. I think she’s afraid my comments about Phoenix might make everyone think that the dirty dusty sprawl of Phoenix represents the entire state. Of course, that’s not true, and here’s proof. It’s been a hectic but very enjoyable week here on the East Coast, but all good things must come to an end. Tomorrow I’m jetting back to the heat and the illegal alien capital of the U.S., so they’ll be no blogging until after I’ve slept in my own bed tomorrow night and a quick check on Mr. and Mrs. Mourning Dove Sunday AM. Talk to ya then! No matter what your situation, it is through each other that our individual rivers are nourished and replenished. May we always recognize it to be so. It is an absolutely gorgeous spring day here in MA – a perfect time for listening to some Beach Boys tunes, squeezing a little work in, and checking on what’s going down at a few of the blogs on the GBN blogroll. And Rightly So has its virtual potpourri of interesting stuff. Ditto Flight Pundit, whose sister ran a fantastic Boston Marathon time the other day. Unfortunately, Michael may have to face running one himself Come December. Check them both out! And about that continuing Don Rumsfeld lynching party out there, led by (among others) “Waco Wesley” Clark: Laura Lee at The Wide Awake Cafe links to a NY Observer piece showing there are others who also think this might be a case of “peacenik envy”. Laura’s site is always well worth visiting. Finally, we met an artist tonight at dinner who’s work is truly astounding. His name is Jack Bordenca, and examples of his craft can be found here. I have added him to the Blogroll, so please take a look-see and let him know what you think. Goodboys Nation welcomes aspiring artists like Jack and Dollar Bill; even if your support consists of a few words of encouragement, well that helps out a lot!